We produce our pottery at the Ozark Folk Center State Park in Mountain View, Arkansas. During the visitor season, we demonstrate the art of making wheel-thrown pottery to the public. We form pots out of raw clay. The following day, we trim and decorate them. To decorate the pot we press a fern or hand-made stencil into the surface of the clay. Colored clay, or slip, is then painted over the stencil. Once the colored clay stiffens, the fern or stencil is removed. Our path to become potters was not a direct one. We both are certified to teach and hold Masters Degrees in fields other than pottery. 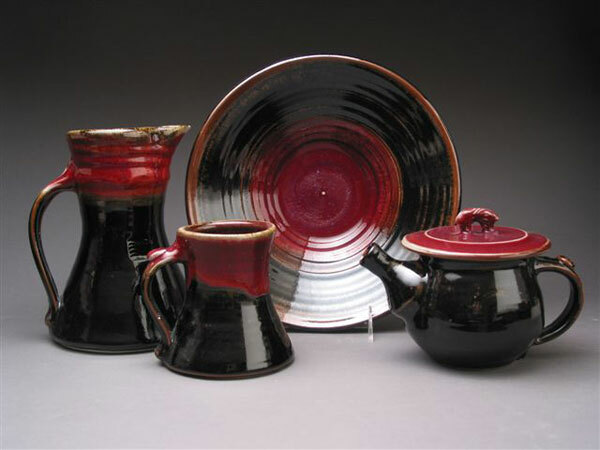 Judi took up pottery with the idea of adding Art to her list of teaching certifications. In 1992, after a year and a half of classes, she got an apprenticeship at the Ozark Folk Center with David and Becki Dahlstedt. John began his apprenticeship in pottery in 1996. We both teach pottery at various times of the year at the Folk Center. We love making our living using our hands. It is satisfying to start with a lump of clay and produce a piece of work that may last for 5000 years, or more! The work sold here is functional stoneware. We designed it to be used and enjoyed. All of our pottery is microwave safe, oven proof, and dishwasher safe. Judi’s work is in the collections of Hillary Rodham Clinton and Senator Dale Bumper’s wife. An article written by Judi was published in January of 2002 in Ceramics Monthly Magazine. It was called “Pure Whimsy” and focused on her slip decorated animal pottery. Their work has won a variety of awards and honors. One of her pitchers is included in the book 500 Pitchers.